Hugh Samuel Johnson (1882 - 1942) American soldier and NRA administrator. He was born in Kansas in 1882. 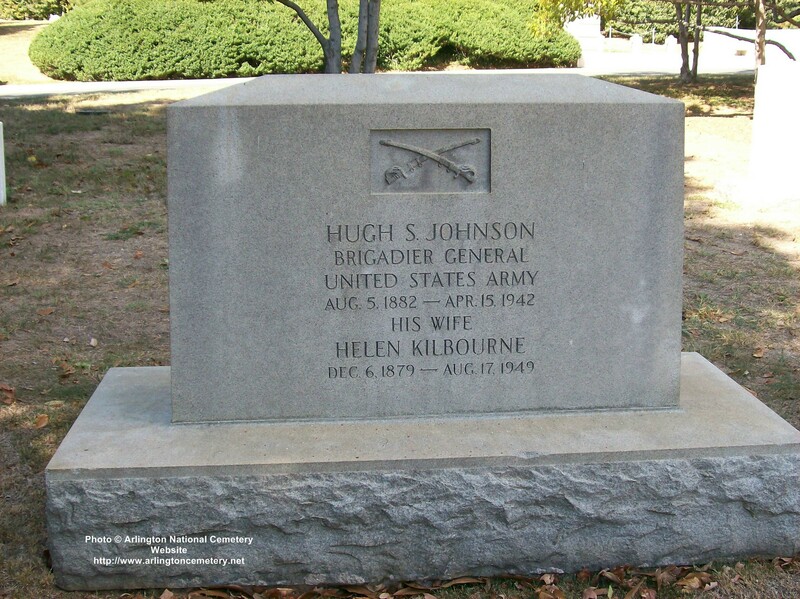 After graduating from the United States Military Academy in 1903, Johnson became an officer in the US Army. Johnson served under General John J. Pershing in Mexico during 1916 and the following year became deputy provost marshal general in Washington. When the United States entered the First World War, Johnson helped draft the Selective Service Act. 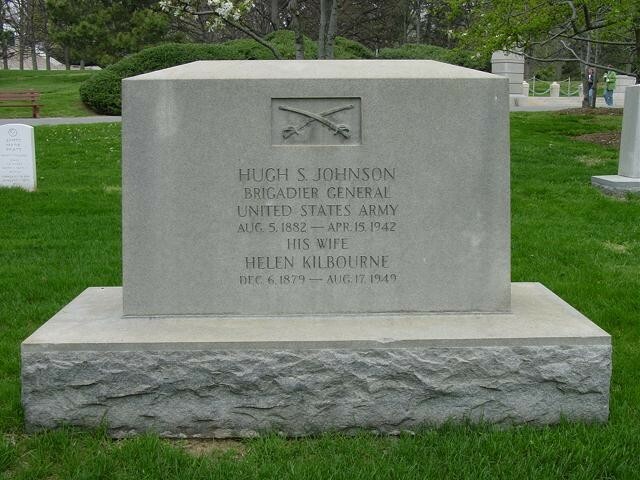 By 1918 Johnson had reached the rank of Brigadier General. His main duty was coordinating Army's purchases with the War Industries Board. He retired in 1919 and became an executive of Moline Plow Company. He left to become an advisor to Bernard Baruch in 1927, and campaigned for Franklin D. Roosevelt in 1932. In 1933 Roosevelt appointed Johnson to administer part of the National Recovery Administration (NRA). This involved organizing thousands of businesses under fair trade codes drawn up by trade associations and industries. 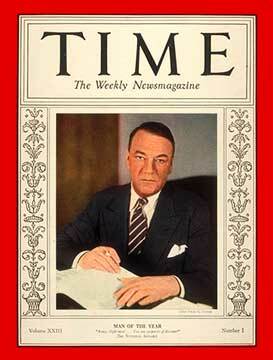 He was recognized for his efforts when Time Magazine named the colorful New Dealer Man of the Year of 1933. "Old Iron Pants" could mix theorizing about industrial reorganization with evangelism for the NRA's omnipresent symbol, the "Blue Eagle." He was faltering badly by 1934, which historians ascribe to the profound contradictions in NRA policies, compounded by heavy drinking on the job. Roosevelt replaced him in September, 1934 and lert him have a WPA position. Johnson supported Roosevelt in 1936, but when the Court packing plan was announced in 1937 he denounced Roosevelt as a would-be dictator. He supported Wendell Willkie the Republican candidate in 1940, and in retaliation Roosevelt denied him any role in World War Two. Hugh Samuel Johnson died in 1942. 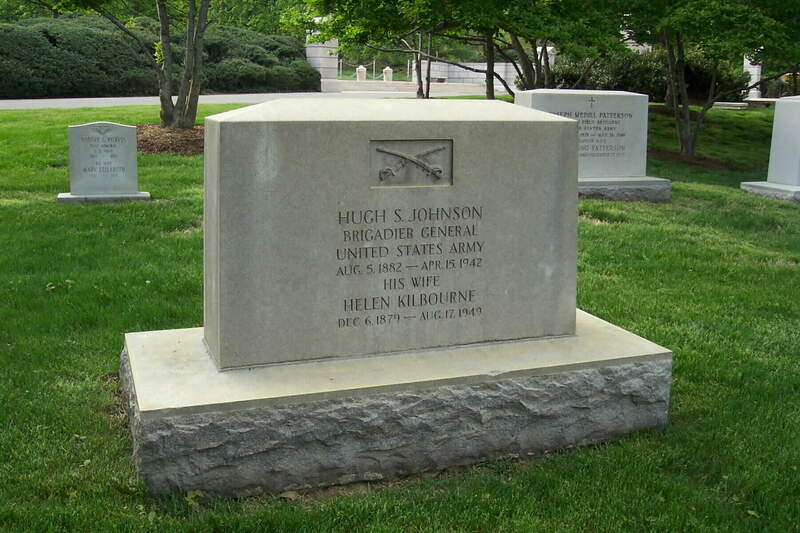 As head the National Recovery Administration (NRA), Hugh Johnson was FDR’s leading bureaucrat. Jerry MacGuire told General Butler that J. P. Morgan’s interests wanted Johnson installed as a Secretary of General Affairs to run the country. MacGuire also said FDR would fire Johnson within a month, because he “talked too damn much.” Butler asked “How do you know all this?” MacGuire said “Oh, we are in with him all the time. We know what is going to happen.” When FDR demanded his resignation a few weeks later, Johnson became one of FDR’s loudest critics. Had Johnson really been the coup plotters’ inside man, as MacGuire said? Did he collaborate with MacGuire’s financers, while on FDR’s team? Who was Johnson and how did he get so close to the president? Johnson graduated from the U.S. Military Academy in 1903, and served in General John Pershing’s 1916 invasion of Mexico. Backed by warplanes and motorized vehicles, 4,800 U.S. troops chased revolutionary Pancho Villa. Back in Washington in 1917, Johnson was a deputy provost marshal general. In World War I, he helped draft the Selective Service Act and, by 1918, was a brigadier general. He directed the Army’s Purchase and Supply Branch and knew Samuel Bush (great grandfather of George W. Bush) the Ordnance, Small Arms and Ammunition section chief, War Industries Board (WIB). According to the U.S. Army’s Center of Military History, Johnson was “brilliant, young, inpatient and abrasive” and “soon in hot water with many of his military colleagues, including the Chief of Staff.” Johnson left the job “disgruntled,” but not empty handed. He had now acquired a powerful mentor, Bernard Baruch, the chair of President Wilson’s WIB. A Wall Street financier, with a seat on the New York Stock Exchange, Baruch was responsible for mobilizing the nation’s industries for war. From then on, Johnson was Baruch’s friend, representative, associate, protégé or crony, depending on one’s sources. After WWI, Baruch was a U.S. delegate to the Paris Peace Conference, and sat on the Supreme Economic Council. He later engineered Johnson’s placement on FDR’s team. In 1919, Johnson was a partner in the Moline Plow Co., which Universal Tractor bought in 1915. After World War I, when car makers like Ford and GM, began making tractors, John Willys purchased Moline Plow. In the 1920s, he sold it to partners George Peek and Hugh Johnson. In 1921, Baruch helped them launch the “equality for agriculture” movement to get government farm subsidies and help their firm’s bottom line. "approached Roosevelt,… they had the added advantage that with their policy ideas came significant campaign contributions…. The [Wall Street] ‘speculators,’ Bernard Baruch and Joseph Kennedy [a Nazi sympathizer and patriarch of the American political dynasty], were the most generous and the most demanding…. As General Hugh Johnson, Baruch’s associate, put it [in The Blue Eagle from Egg to Earth, 1935], any time there was a financial crisis in [FDR’s] campaign, Baruch ‘either gave the necessary money, or went out and got it.’"
Baruch’s fundraising bought him the right to plant his man, Johnson, on FDR’s policy staff. Fronting for Baruch, Johnson countered the Brain Trust’s plan to use government control and planning to stop runaway corporate power. Baruch, and clone Johnson, argued for “industrial self-government.” Within a week of FDR’s nomination, one Brain Truster, Rexford Tugwell, worried that Baruch now dictated FDR’s financial policies. Johnson’s scowl, his broad mouth and furrowed brow, his pithy epithets, the daily state of his health and temper, made acres of news pictures, miles of news copy every 24 hours. He was not the Administrator of NRA, he was NRA. Besides Johnson, another highly-visible NRA symbol, the “Blue Eagle,” was displayed by cooperating businesses. Under NRA supervision, each sector of the economy developed a code to govern itself. Corporations, especially the biggest ones, were happy with this plan, designed by Johnson and Baruch. Industries devised their own production standards, fixed prices and set wages. And, once they agreed to abide by their sector’s code, they were exempt from antitrust laws. To many, this was indistinguishable from having illegal monopolies and trusts. Labor was supportive at first because NRA codes were to eliminate child labour, set maximum hours, minimum wages and safe working conditions. In theory, the NRA also guaranteed labour rights. But, the new system allowed big corporations to dominate each sector by rigging the codes with little or no input from unions, consumers or the NRA. "At the first meeting of the Cabinet... in 1933, [FDR’s] financier and adviser, Bernard Baruch, and Baruch’s friend Gen. Hugh Johnson... came in with a copy of a book by [Gio-vanni] Gentile, the Italian Fascist theoretician [Mussolini’s Education Minister], for each member of Cabinet, we all read it with great care. Like the Italian fascists, Johnson was no friend of unions. San Francisco’s 1934 general strike exemplifies this. George Seldes sets the scene: In the first three days, the city was in a holiday mood and there was no real suffering from lack of food deliveries. The strikers did not stop the rounds of milkmen.… The press [and]… paid radio orators, preached fear and hatred. News was distorted, invented, colored with propaganda; radio speeches were pure demagoguery. The villains were always the ‘Reds’ and ‘foreign agitators.’ The newspaper-reading citi-zenry and radio masses were quick to respond to hysterical suggestions, when as a climax Gen. Hugh Johnson, arriving as mediator, delivered… a senseless blast against labor which became the newspaper signal for hysteria: ‘When the means of food supply–milk for children–necessities of life to the whole people are threatened, that is bloody insurrection.’"
burly, blunt, often tactless and profane, with a face that might be described as ‘40 miles of bad road,’ he chain-smoked Old Golds, drank too much and too often, and sometimes vanished into an alcoholic void. He had a close relationship with his assistant, Frances ‘Robbie’ Robinson, that many assumed was more than just professional. On May 27, 1935, the Supreme Court ruled the Johnson/Baruch code system unconstitutional because it gave legislative power to the executive. Huey Long later described Johnson as “one of those satellites loaned by Wall Street to run the Government, and who, at the end of his control over and dismissal from the NRA, pronounced it ‘as dead as a dodo’” The NRA’s blue eagle was indeed extinct, but Johnson wasn’t. He got a column in the Scripps-Howard newspapers and hurled abuse at FDR. Johnson also blasted Huey Long and Father Coughlin. The fascist radio priest came back swinging with veiled anti-Semitic punches at Johnson like: “Where were you in 1933 and 1934 when our beloved leader [FDR], consecrated to drive the money changers out of the temple, was hampered and impeded by your master, Bernard Manasses Baruch, the acting president of the U.S., the uncrowned prince of Wall Street?” Baruch, said Coughlin, was Johnson’s “task-master,” his “prince of high finance.” Coughlin also swiped at Wall Street efforts to return American to the gold standard and linked Baruch and “his group of speculators and international bankers” to “the Rothschilds in Europe, the Lazzeres in France, the Warburgs, the Kuhn-Loebs, the Morgans and the rest of that wrecking crew of internationalists whose god is gold.” Coughlin pushed the Silver Standard because he was (secretly) one of America’s top silver owners. He also knew firing potshots at bankers, especially Jewish ones, played well. Johnson infiltrated FDR’s inner circle thanks to campaign donations from his mentor, Baruch (who advised every president until Eisenhower). Johnson then used the NRA for Wall Street’s agenda. When they realized Johnson would soon be fired, they stepped up other plans to retake control over FDR’s administration.